Tucson has made another addition to the already historic 4th Avenue. Small businesses, a raging nightlife, and multiple street fairs are some of the great things that it has to offer. 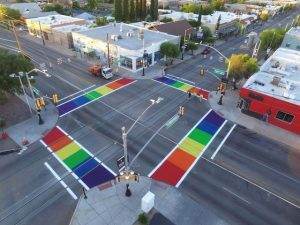 4th Avenue has now joined other cities in the nation by adding rainbow crosswalks to honor the LGBTQ community. These new additions truly and deeply impact the city’s progressiveness towards diversity. It is a really joyous moment to have the community come together and celebrate. Hopefully, one could hope, a domino effect will occur and more cities across the nation will follow the same suit. Workers from Speedy Striping Inc. painted the rainbow crosswalks. They did an amazing, impressive job. The meticulous workers created the crosswalks by creating a mixture of glass beads and traffic grade epoxy. The crosswalks should be able to last up to 3 years. This historic event has made many of the businesses on 4th Avenue very excited. 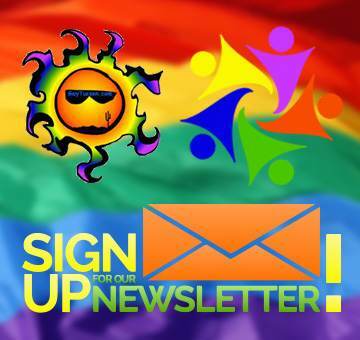 They hope that the bright rays of rainbows will bring more visitors to Tucson’s downtown life. 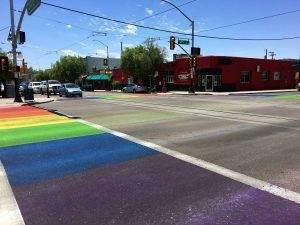 Combined efforts between Ward 3 Council Member, Karen Uhlich, The Southern Arizona AIDS Foundation, The City of Tucson, and The 4th Avenue Merchants Association made The Rainbow Crosswalk Project a success. A formal ceremony took place, on the 8th of August, recognizing the groups who worked together on this project. All of the organizations volunteered their time and equipment to bring the crosswalks to life! Yesterday, I made a trip to go see the crosswalks for myself. It was such a great sight to see. As I stood there, it literally felt like time stood still for a brief moment and I felt a little more free. I hope you, as well, can make a trip down to our historic 4th avenue and have a look for yourself!